Healthy living and high thinking is the success mantra to lead a happy life but unfortunately we go by the later part forgetting the importance of the former. Health is wealth and this is what we should be taking care of. Many of us who ignore this fact land up into great mess, we fall victims to various health problems like headache, joint pain, stomach ache, frozen shoulder etc. which act as barriers in our day to day life. Like all other complications we face, frozen shoulder is also an ongoing ailment from which a large group of people are suffering from. It results in the capsule surrounding the shoulder joint to expand leading to the formation of scar tissue. Inflammation and stiffness in the joints are experienced by the patients suffering from frozen shoulder. Adhesive capsule is another name to the frozen shoulder which leads to severe pain causing great amount of depression and frustration. Apart for injury experienced by you, some other reasons that are the cause to this ailment are age and gender, Endocrine Disorders, Shoulder Surgery and other systematic conditions. 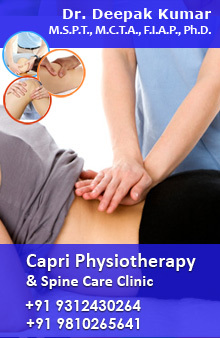 Regular Physiotherapy treatment is the best manner in which the shoulder movement can be restored. We at Delhi physio provide best quality Physiotherapy treatments to the victims of frozen shoulder. Our experts work to offer the most apt treatment, keeping the day to day record of the progress and gently freeing our patients from the pain. We aim to cure our patients in the best possible manner by helping them overcome their disorders in the most cost effective way.